Stop smoking medications should be routinely prescribed and e-cigarettes should be available on hospital premises. 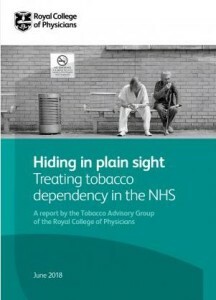 Hiding in plain sight: Treating tobacco dependency in the NHS demonstrates that clinicians working in almost all areas of medicine will see their patient’s problems improved by quitting smoking, and that systematic intervention is a cost-effective means of both improving health and reducing demand on NHS services. Smoking cessation is not just about prevention. For many diseases, smoking cessation represents effective treatment. It calls on doctors to recognise that recognising and treating tobacco dependence as their business, and to incorporate smoking cessation as a systematic and opt-out component of all NHS services, delivered in smoke-free settings. iPiP has been working with various organisations to help them deliver a more effective ‘Smokefree NHS’. For more information on this and to find out how we could help you contact us.